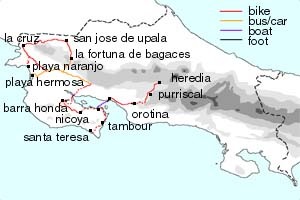 Heredia -> Orotina (via the old road) -> Puntarenas -> Playa Naranjo (by ferry) -> Playa Tambor -> Playa Malpais and Santa Teresa -> Jicaral -> Nicoya -> Barra Honda -> Limonal -> La Fortuna de Bagaces (by car) -> Hacienda los Innocentes (via San Jose de Upala) -> Station Santa Rosa -> Playa Naranjo Santa Rosa -> Liberia. 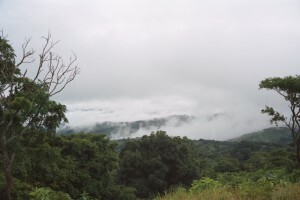 This tour included the northwest and the beaches of the Nicoya peninsula. Some of the highlights were beach camping in Santa Rosa National Park, Ray’s birthday on the beach at Santa Teresa and Barra Honda National Park. There must be something about Sue and I and the first day of bike touring on a trip. 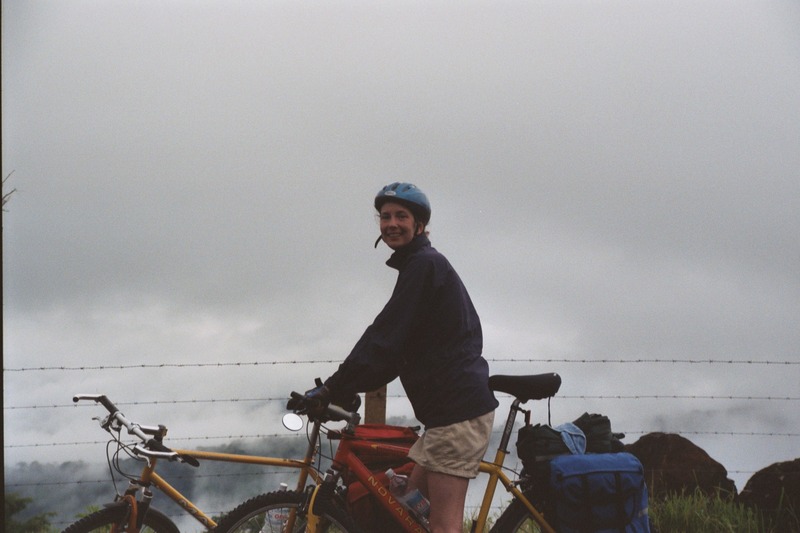 We had almost killed each other the first day of our honeymoon trip, and even though we had taken a few days to loosen our muscles without carrying our panniers, we weren’t in any shape for what the first day of this tour held in store. We knew that there were some mountains to climb between Heredia and the coast where we planned to catch the ferry to the Nicoya peninsula, but we knew there were plenty of places to stay in between. We were taking a back route, because the Pan American Highway between San Jose and Puntarenas is no place for cyclists. It is the route of careening tractor-trailers and psychotic bus drivers and is scary as hell, even in a car. Our friend Quincho helped us plan the alternate route, and check with people that had friends or family along the way to make sure that the roads on our maps were still there. We climbed over the first pass in bright sunshine and stopped for lunch near the top in an open-air restaurant with views across the whole central valley on one side, and the mountains we still had to cross on the other. We looked over our accommodation options for the next 30 or so kilometers and found we had lots of choices. I think our mistake was feeling too good as we passed through Puriscal in the bottom of the valley only a few minutes after lunch. If we had felt tired we might have stopped. We had traveled a lot farther than we realized because we were flying down a 6-8% grade, and we had passed a lot of our cabina options without even noticing. We started up the mountain on the west side of Puriscal with no particular sense of trepidation, but by the time we reached the crest we were tired and it was starting to get late. We had enough sense to be a little worried, but it was all downhill to Orotina, and the road was paved. We would have sacrificed the elevation gain and turned around if we knew what lay ahead.